Art and beer, beer and art. These two things don’t necessarily go together, but in Abensberg, a small town not far from Regensberg, in Bavaria there is a brewery and beer garden where it’s all about the art. It boasts a magical tower that will have the kids of all ages gaping and smiling. Jim and I heard about this unusual combination, and couldn’t wait to go. 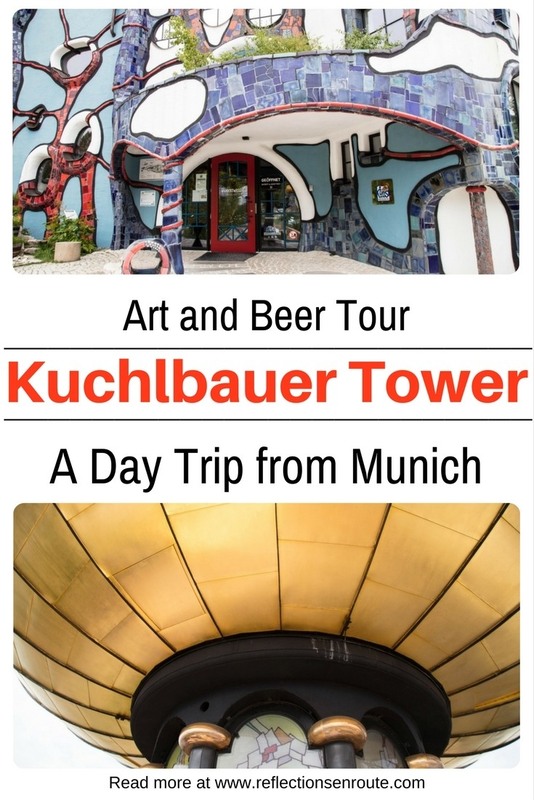 Honestly, it doesn’t take much to convince us to visit a brewery anyway, but with a little whimsy, you just can’t keep us away, and one thing that the Kuchlbauer Tower promises is whimsy! The top of the Kuchlbauer Tower. So much to look at, the views and the art. The Kuchlbauer Brewery, brewing wheat beer or weizenbier, a wheat beer, for over 700 years, has put a unique twist on the grounds of their production. 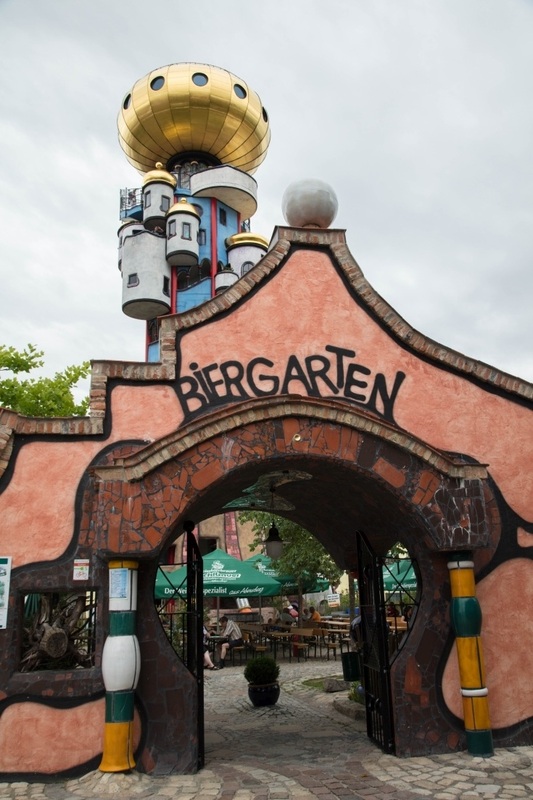 Wanting to stand out and attract people to their brewery, since breweries in Bavaria are practically on every corner, the family decided to enlist the help of a colorful and well-known artist, Friedenreich Hundertwasser. 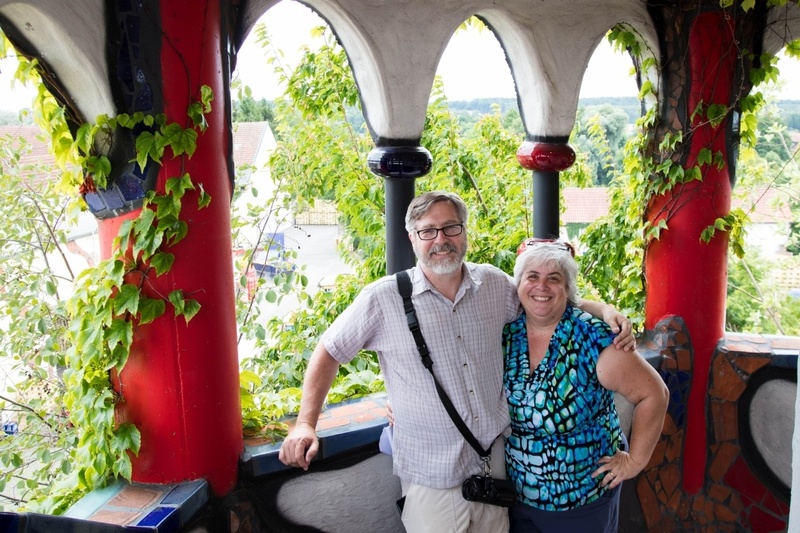 With the addition of many interior designs as well as the Hundertwassturm, or Kuchlbauer Tower, a day trip to the Kuchlbauer Brewery should be on everyone’s Germany itinerary. The Kuchlbauer Brewery and its special Hundertwasserturm or Hundertwasser Tower. The brewery tour is also a bit different than any other brewery tour I’ve taken, such as the Pilsener Urquell Brewery or the Guiness Storehouse. On those tours, you learn a bit of history of the brewery, the process of making beer, and then you usually get to taste some. 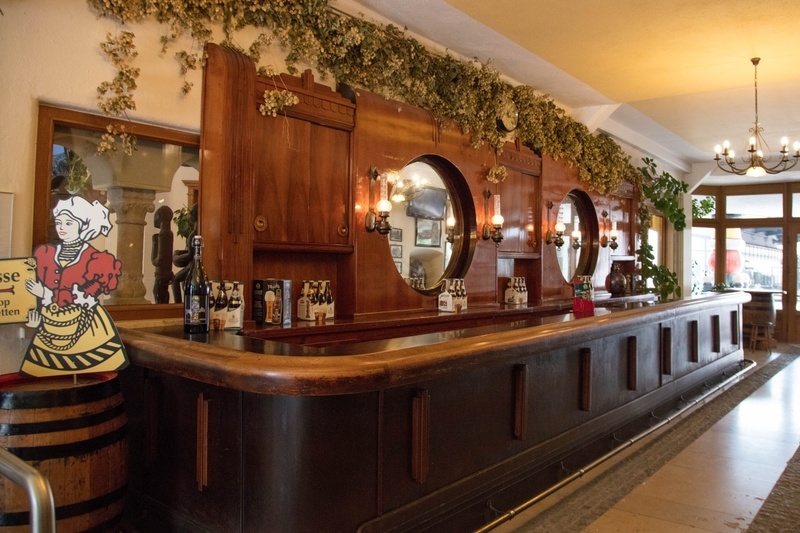 These basic elements were also present at the Abensberg Kuchlbauer Brewery, but with a few extra-special touches added in. The beginning of the Kuchlbauer Brewery tour. We hadn’t made reservations, so we bought our tickets and found out that we had to wait one hour before there was room for us on a tour. That was okay, though, because outside of the brewery is the Hundertwasser Kunsthaus. 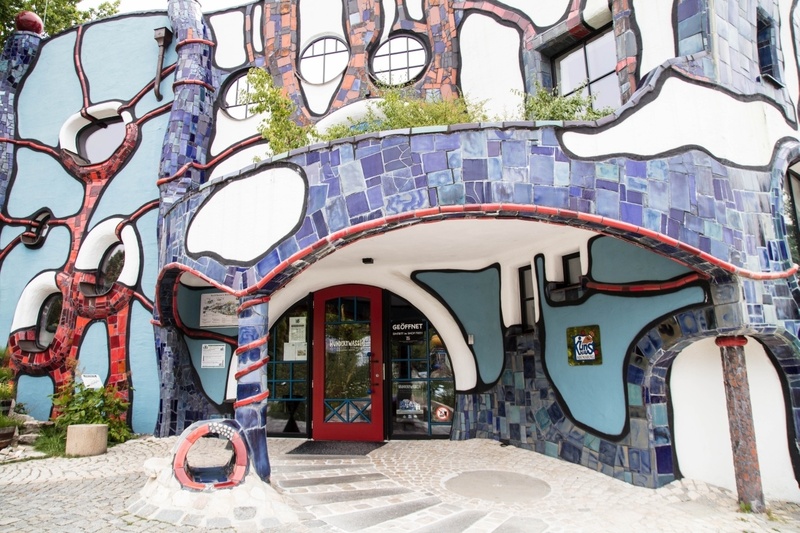 The entire building was designed by Hundertwasser. The exterior is a rich blue color, with plenty of his iconic curvy shapes and a twisted tower all covered in a dinosaur mosaic. The unusual building is a piece of art all on its own, and inside is not only a store but a museum dedicated to the artist and his work. 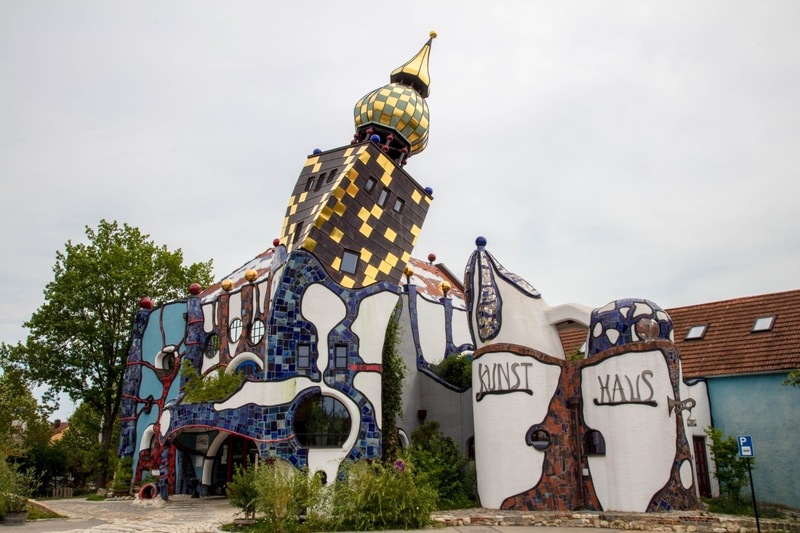 The Kunsthaus where you can learn all about Friedensreich Hundertwasser, the artist. It is here we saw examples of his architectural style as well as plenty of his other art to include the postage stamps, sketches, paintings, and original plans for the Kuchlbauer tower. Our hour nearly up, and our heads full of color and design, we headed back to the brewery for our appointed tour. Along the way, we learned just how many Bavarian breweries exist and it is easy to determine that a brewer really did have to think of a unique way to market his business in order to do well. Part of the tour, why the need to add the Kuchlbauer Tower – to draw folks in. The tours are only conducted in German with an English brochure to follow along, but on the route there were plenty of slide shows and videos which were also in English. Some of the rooms had displays with Disney-esque talking dolls telling us part of the story or how healthy beer is for a human. I have to assume this added guiding and commentary was specifically to keep the children entertained. We had three young children with us, and of course the brewery dwarves were their favorite part. (They had been dwarf-minded since we’d visited the amazing city of dwarves in Wroclaw, Poland). Dwarves explain the brewing process on the Kuchlbauer Brewery tour. One of the strangest special attractions was far down in the basement of the brewery where a full wall was dedicated to a faux “Last Supper” and a video telling how the secret had been explained. This video also had English, but to be honest, it was a bit too weird for me. I’m sure I’ll be much more interested in seeing the real thing in Milan. 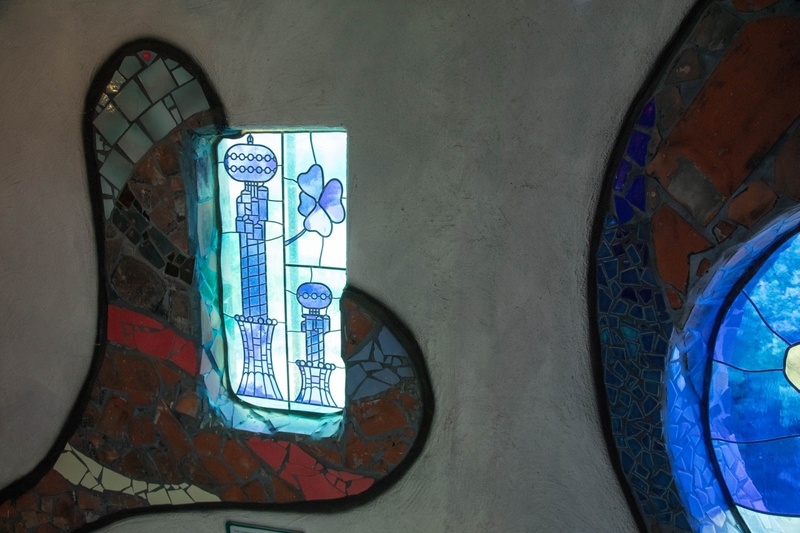 Throughout the brewery, there were signs and mosaics designed by Hundertwasser who, being an environmentalist, likened much of his work to the natural world. The floors of the brewery were like climbing from the underworld to the heavens, so each room had a name or some type of earthy significance. I just thought the lines and mosaics were bright, colorful, and fun. It was all a bit surreal, though. The absolute best part of the tour, as is usually the case, came at the very end. The tour guide led us to the basement of the Kuchlbauer Turm, and sat us down for one last video. He made sure to tell everyone that the bathrooms were worth a visit, and they were, and then let us go to first explore the tower and then at the very end, go into the beer tent or garden and enjoy our free drink and pretzel. 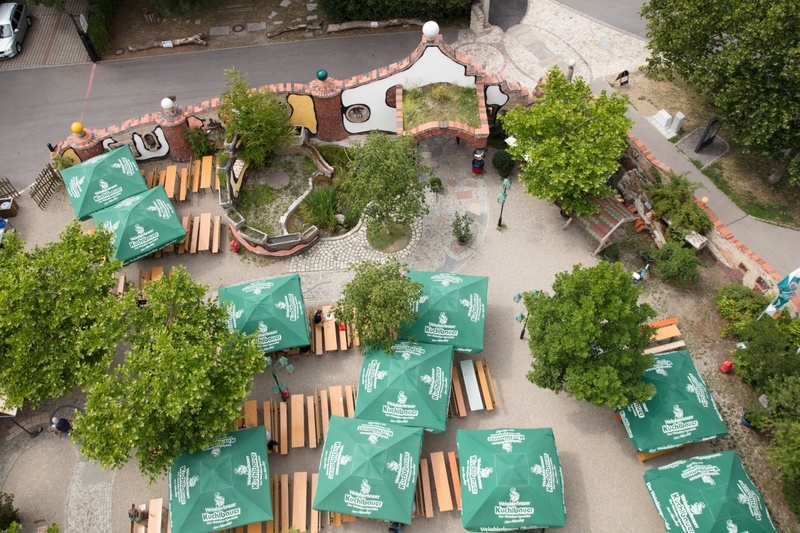 Entrance of Kuchlbauer beer garden. 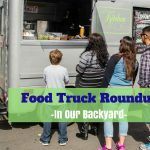 You don’t have to take the tour to eat and drink here. 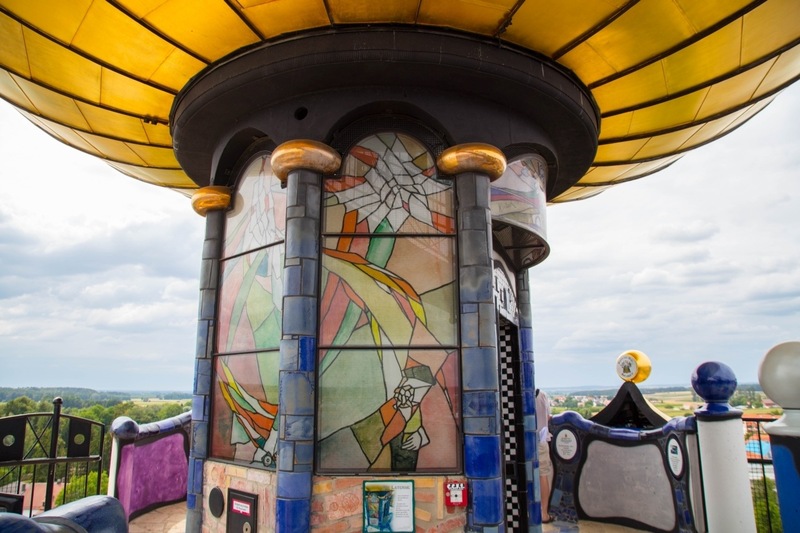 Born in 1928 in Vienna, Hundertwasser was a talented painter, architect, and avid ecologist. He made his paints himself, and he tried to incorporate earthly elements into all of his works. He loved color and crooked lines, curves and bold statements. His style, completely unusual, is mesmerizing. It has a sense of play to it. 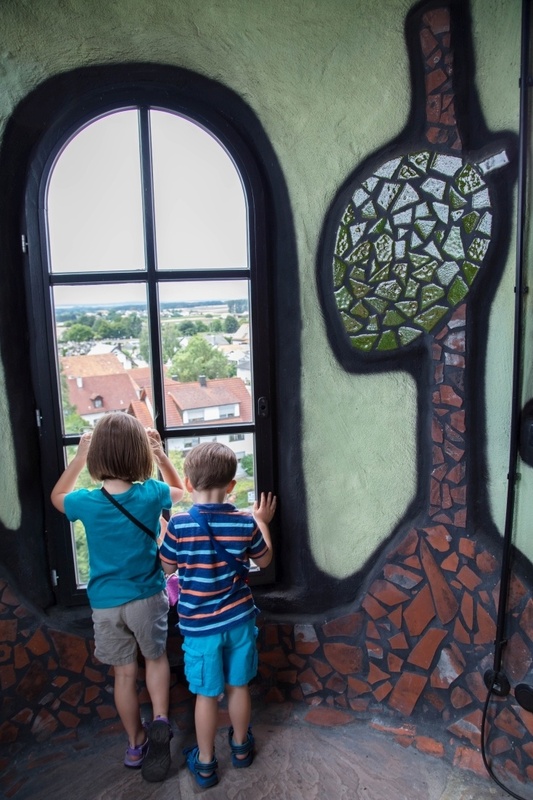 The main reason to go to the Kuchlbauer Brewery is definitely to be able to climb the Hundertwasserturm. I love Hunderwasser’s architecture, it’s so different, colorful, kid-friendly. It brings a smile to my face. I might have to start seeking out some of these other unusual buildings around Europe that he designed. Check out this video of the Top Ten Hunderwasser buildings. Do you love art? How about beer? Climbing towers? No matter. 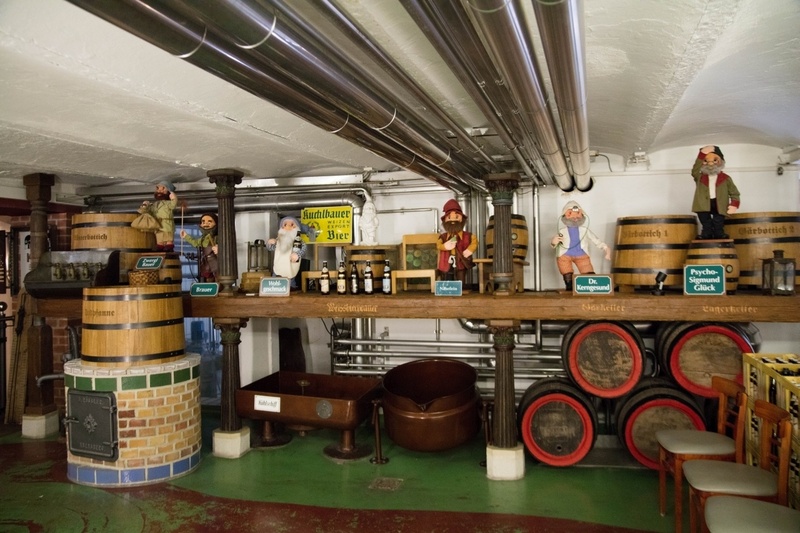 You really, really need to experience this one of a kind brewery tour in Abensberg. 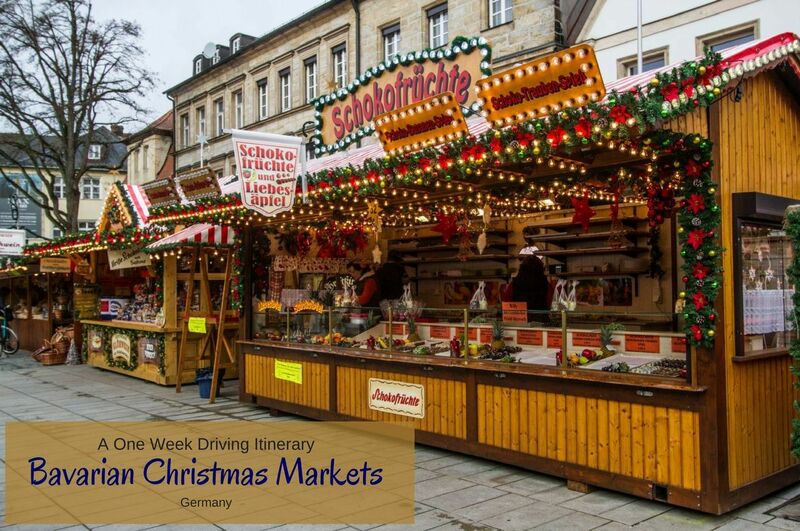 It’s not a long trip from Munich, and you can easily combine it with a trip to the Oktoberfest, the Hofbrauhaus, the Hops Museum...so many beer-related things to do! Opening Hours: There are winter and summer hours, but you can be safe if you plan to be there between 10:00 and 5:00. The entire business closes down for a week at Christmas as well as a few other holidays during the year, so check the website carefully when you are planning your trip. Cost – There is quite a bit of choice when buying tickets. You can buy just the brewery and tower, or you can get a combined ticket with Kunsthaus as well. Prices range from 12 – 18 Euros for adults and 5 – 8 Euros for children, although there is a family ticket as well. We bought the combined ticket, and I’m glad we did. I didn’t really know about the Kunsthaus before I went, and I loved learning more about the artist. Of course if you just want to see the tower from the outside and not take the tour, you can still visit the beer garden and enjoy the beer. From A93, following the main road you are entering town via Muchener Strasse. Here is a close up. By car: Abensberg lies about ten minutes off of the A93 and there are easy to follow signs to the town. 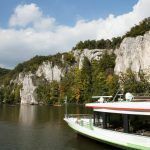 It is about 30 minutes drive from Regensburg, and one hour from Munich. 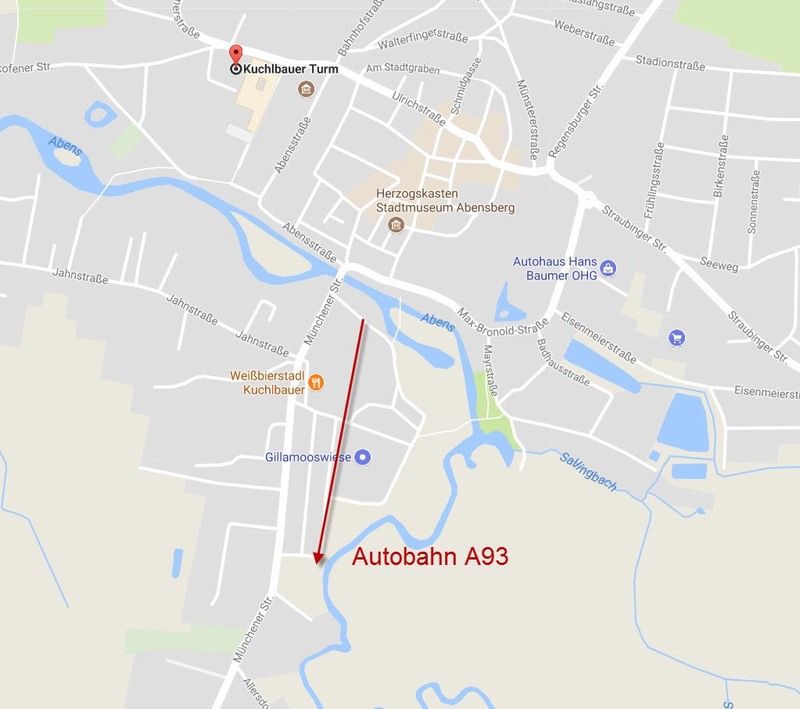 By train: You can take a local train from Munich to Ingolstadt, but get off at at Rohrbach/Ilm. Trains run every hour. If you contact the museum beforehand to let them know you will need a ride to and from the train station, they will arrange it for you. I couldn’t believe this was a service. Pin the Kuchlbauer Tower and Hundertwasserturm for later! Alexander, It is surprising and a whole lot of fun! You should go if you come to Germany! This place just looks too amazing not to visit it when I come to Germany next year. So cool – looks right up my alley! Jill, It’s great! I’m sure you’d love it. I had no idea this cool of a brewery existed here in Bavaria. I’m no familiar with Kuchlbauer beer (something to do with farmers back in the day I guess, bauer=famer! ), but this brewery looks very unique that I’ll have to visit! 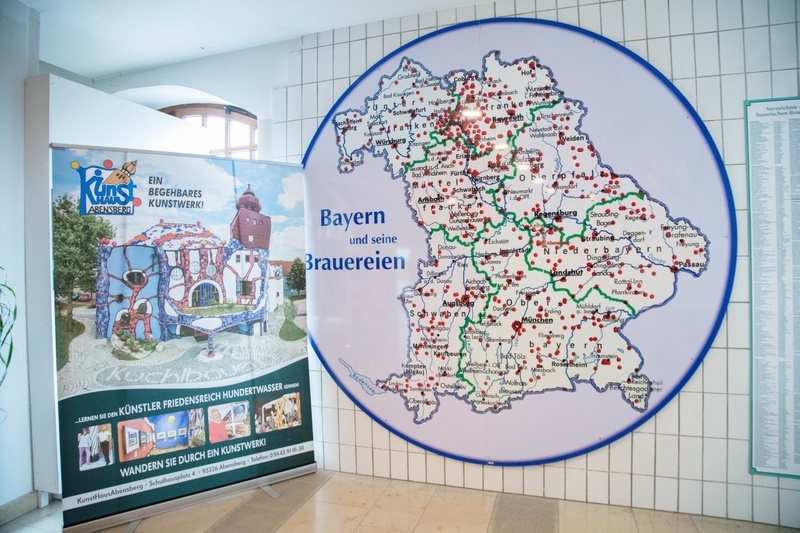 Plus, that map of all the breweries in Bavaria makes me want my own… I’ll have to keep my eyes open for one. Well thank you Tom. I am going to send you an email, so be on the watch for it! 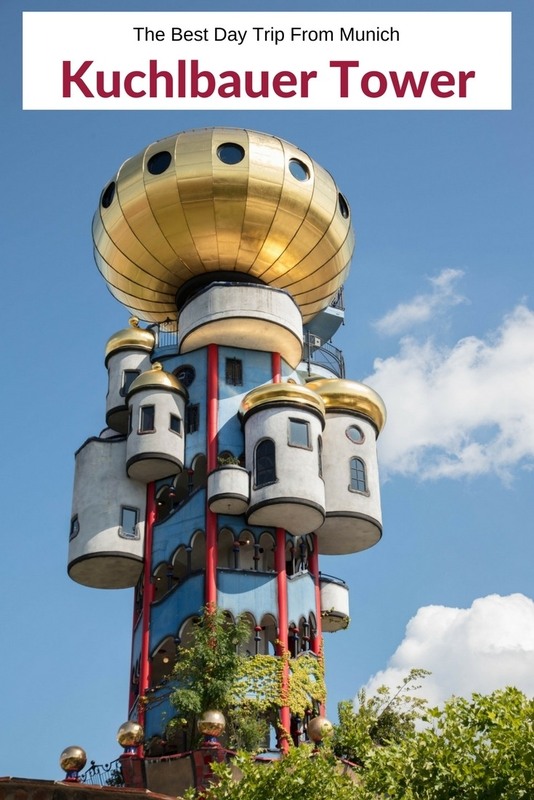 I love Hundertwasser architecture and Kuchlbauer Tower is incredible. That tour looks incredible. Rhonda, The tour is a little quirky, but it’s so worth it to go up and down the incredible tower. 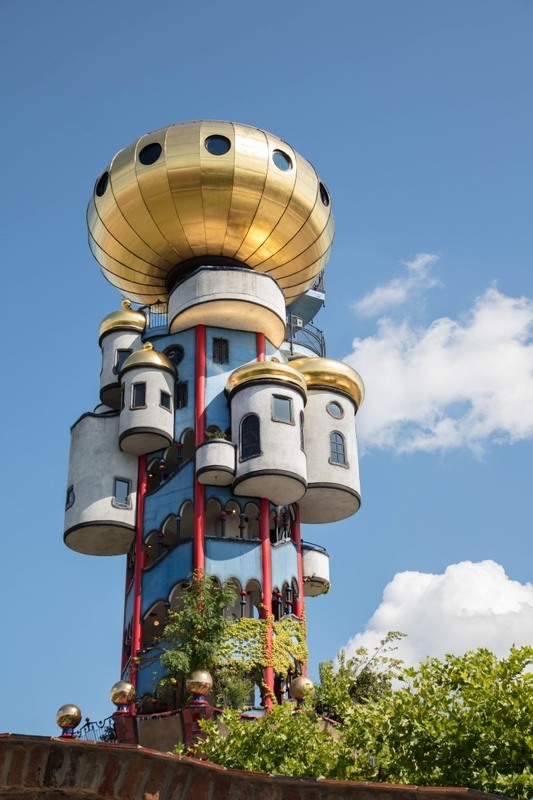 We loved the Kunsthaus next door which is all about Hundertwasser. It’s a fun place.